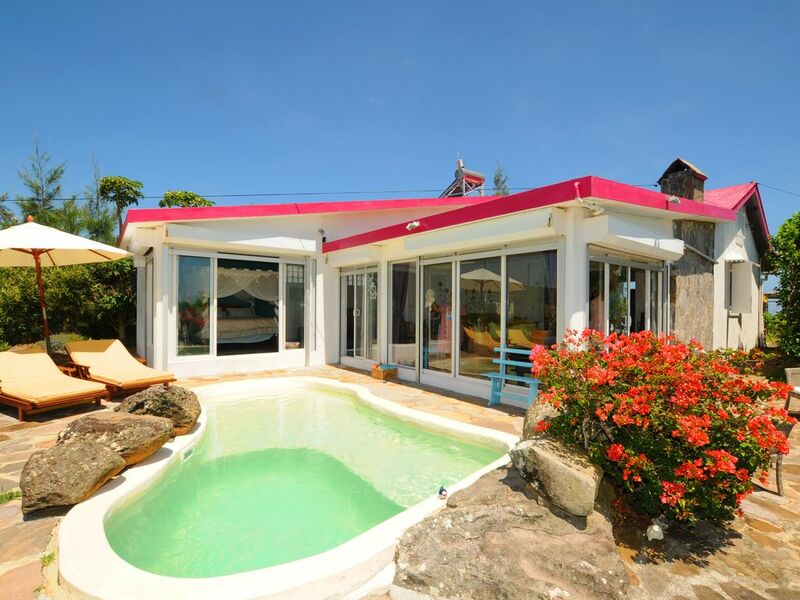 Unique and luxury villa 240 qm² to rent in Rodrigues, with magnificent View and only 8 minutes from the coast with private Pool, chimney, housemaid/cook, ADSL internet and WIFI. The villa is rented for 2 people + 2 people in a separate house on the same ground. Each house has a mezzanine, each for 2 children. The name say’s everything: Beautiful View and sunrise on the horizon; this is our new villa in Rodrigues, neighbour Island of Mauritius; It has a special effect on each visitor when you first see the villa; build in a typical style, fresh colors, luxurious furniture, quiet and cosy, made for nature lovers. You need only 8 minutes to get to the most beautiful beach of the Island. You will have to hire a car or motorbike. We choose to rent the house for 2 people for maximum comfort; But 2 more people and 2 children could also join you, the villa is very spacious and has 8 beddings in total. Please read the description of the rooms carefully, as not all bedrooms have the same standard. Large Living room and Dining room, table for 8 people; Internet and wifi; There is a chimney which you can also use for barbecue; a private pool… Please note: the villa has no specific security for children; They love the 3 mezzanines, but those can be a danger for young children. The pool is not secured and the terrace has no fencing. Children are most welcome under your own care and responsibility. Lorizon is located in 3 Soleils, 5- 10 minutes by car, from the beaches of Fumier, Gravier and St.Francois. The villa is surrounded by nature, guava and mango trees. The next neighbour is 300m away; The view is beautiful, it is calm. The next little shop is 5 minutes away by car and the next bigger village, Mont Lubin about 8 minutes. A housemaid and a gardener are at your service. She cooks and cleans the house, he organises fresh fish and lobster, boat tours and fishing in the lagoon. 1) There is the main bedroom with a four poster bed 2 m x 1.80 m with view on the pool and chimney. Enjoy the sunrise from the bed (5:30 am!). In the same room is a Mezzanine with table and chairs, which serves as little office. Big bathroom with shower, wc, bidet and vestiaire en suite. 2) Over the entrance/kitchen/TV corner, there is a small mezzanine with a kingsize bed 2 m x 1.80 m.. Shower/WC. TV, DVD, HIFI/Radio/CD Player. 3) Separately on the same property, about 20 meter next to the main house is a separate house for 2 people, which is made of 1 big room with a kingsize bed. As in the main house, there is a Mezzanine over the entrance/kitchen/TV corner, with a king size bed; Be aware that the different beddings do not have same standard and might not be appropriate for 3 couples. If you are 2 people (+ 2 children) the lower house will stay empty to ensure your comfort. We do have a baby cot. The drive from the main road is 200 meters long and the last 100 meters can be very muddy and slippery. We recommend a 4 x 4 or a Motorbike.